A collection of Garth Nix's best short stories, featuring a diverse cast of characters - protectors, travellers, warriors - ranging across vividly evoked worlds and times. Far to the north of the magical Old Kingdom, the Greenwash Bridge Company has been building a bridge for almost a hundred years. 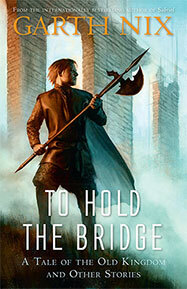 It is not an easy task, for many dangers threaten the bridge builders, from nomad raiders to Free Magic sorcerers. Despite the danger, Morghan wants nothing more than to join the Bridge Company as a cadet. But the company takes only the best, the most gifted Charter mages, and trains them hard. For the night might come when even an untried young cadet must hold the bridge alone against the most devastating of foes. Also included in this remarkable collection are eighteen short stories that showcase Nix's versatility as he adds a fantastical twist on an array of genres including science fiction, paranormal, realistic fiction, mystery and adventure.